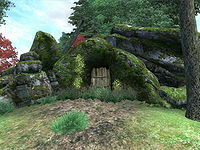 Nisin Cave is a small cave between the Imperial City and Skingrad containing monsters. It contains only one zone, Nisin Cave. This cave contains 5 Cairn Bolete plants and 33 Wisp Stalk plants. 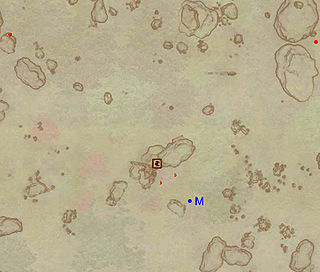 This location's map marker (M on map) is named Nisin Cave (editor name NisinCaveMapMarker). The entrance door is NW of the marker, 60 feet away. 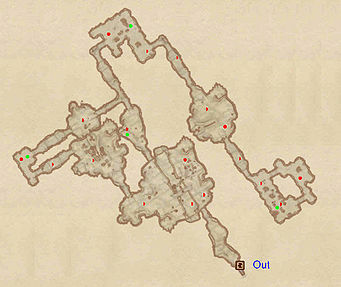 Nisin Cave is a fairly short dungeon with plenty of monsters but it also has a few chests that could contain valuable loot. The cave greets you with a narrow tunnel; follow it to reach the bottom level of a large room. It is advisable to sneak through this area to avoid being detected by the various foes that are located above you. After sneaking through the large chamber, you will find yourself in a room with a chest containing some loot guarded by a nearby foe. After proceeding forward, you will be presented with an intersection; head left and continue through this tunnel until you reach a chest guarded by a nearby opponent. After looting the potions from the chest, you should now backtrack to the intersection as only monsters await you if you head further south through the tunnels. 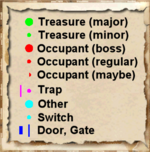 Head north at the intersection to reach a room with a locked chest containing some loot. You must now proceed down a fairly straightforward path south that will be guarded by various monsters. Once you reach the final chamber, grab the potions from the chest and ignore the paths to your left as they only lead to an opponent that is guarding no treasure. You will now need to head back to the entrance of the cave and leave through door Out. This page was last modified on 25 March 2018, at 03:07.